1)Each of the dead should be commemorated by name on the headstone or memorial. Like many who perform genealogical research, Common Wealth War Grave Commission realizes the importance of remembering the past to protect the future. We hopefully will learn from the sacrifices of those who have come before and make a brighter future for those who come after us. The CWWGC contains a searchable database that contains 1.7 million men and women of the Commonwealth military members who died during the first and second world wars and the 23,000 cemeteries, memorials and located throughout the world where they are remembered. The database also contains information regarding 67,000 Commonwealth civilians who died in the Second World War. 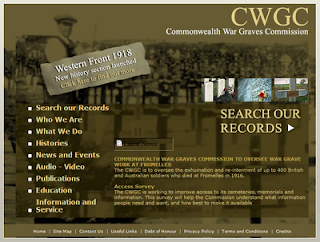 If you would like to learn more about the CWWGC or search in the database, click Common Wealth War Graves Commission. Have fun!